JEBEL ALI, United Arab Emirates – The guided-missile cruiser USS Mobile Bay (CG 53) completed a port visit to Jebel Ali, United Arab Emirates, March 29. ARABIAN GULF – The guided-missile cruiser USS Mobile Bay (CG 53), as part of Carrier Strike Group (CSG) 3, joined with maritime forces from France, United Kingdom, and Australia to complete exercise Intrepid Sentinel in the Arabian Gulf, Jan. 17. 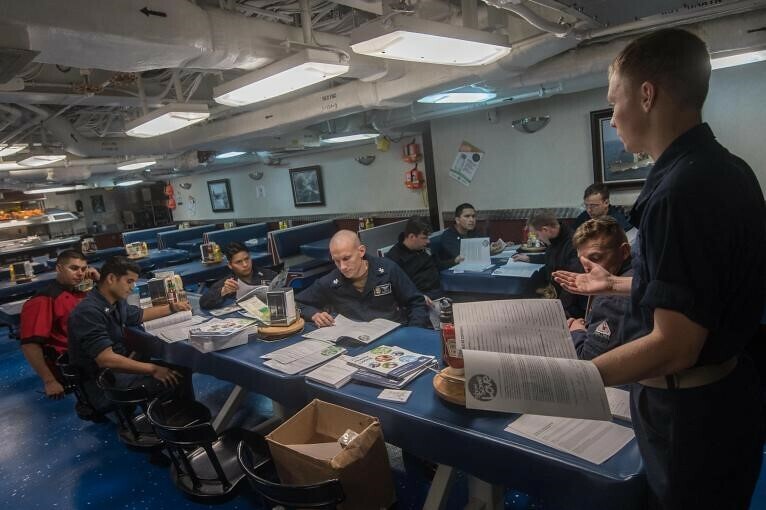 ARABIAN GULF – Sailors aboard the guided-missile cruiser USS Mobile Bay (CG 53) participated in the Combined Federal Campaign (CFC) throughout the month of January. ARABIAN GULF - The guided-missile cruiser USS Mobile Bay (CG 53) held a change of command ceremony on the ship’s flight deck, Dec. 22.